at Offshore Sailing School on Captiva Island, Florida. On their practice sail without the instructor aboard, Rob asked Lisa to marry him. When they returned to the dock they told their instructor, Mike Dewane, who took a picture and sent it to Offshore Sailing School headquarters where it popped up in Doris Colgate’s email. the end of the year.” Before the couple flew down to Florida, Rob asked Lisa’s mother for her hand. But Lisa had no inkling what was about to happen. Lisa and Rob are both helicopter pilots for a global helicopter company that primarily supports the oil and gas industry, provides search and rescue (SAR) to foreign governments, and operates several fixed wing airlines. “She and I are both aviation nuts, to say the least, and fly both airplanes and helicopters,” says Rob. They met at work flying helicopters for the same company in the Gulf of Mexico and their next assignment will be in Africa working a six week on six week off rotation. So, according to Rob there will be plenty of time for sailing. Rob erklärte ihr nächstes romantisches Segelabenteuer ist abgeschlossen Bareboat Sailing Certification Kurs mit Offshore Segelschule,en, gaining certificates of international proficiency: “Since our rotation ends in the eastern hemisphere, if it&#8217;s God&#8217;s will, and we live, we will sail the waters of Greece and Croatia!” he exclaimed. Have there been other engagements on Offshore Sailing School boats? The Colgates say two stories come to mind. 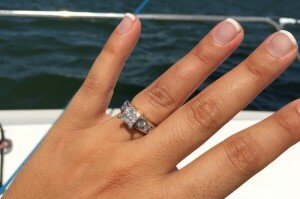 One occurred in New York Harbor when, during the last day of the Learn to Sail course during the spinnaker is demonstrated, it popped out with “Will you marry me?” emblazoned across it. On another occasion, a student asked the instructor if he and his girlfriend could sit on the cruising boat after the course. They sipped cocktails as he not-so-calmly waited for his soon to be fiancé to finish her drink. She did and was about to throw the ice overboard when he panicked. He had embedded the engagement ring in the wedge of lime in her drink! To Rob and Lisa, “Thank you for choosing Offshore Sailing School for your sailing education, and here’s to a lifetime of happy sailing!" If you have thoughts about getting engaged while taking at a course at one of our fabulous resort locations, give us a call – 888-454-7015 oder 239-454-1700. We’re here to make it a fun experience! Flotilla Cruise in the Britische Jungferninseln just a few months away, beginnt Dezember 5, 2015. And then next spring and summer, flotilla cruises for our graduates in the Bahamas and, ja, Kroatien!